At tonight’s D23 Expo Japan presentation at (where else?) Tokyo Disney Resort, Disney Parks and Resorts may not have revealed a tidal wave of new announcements – as the division did at the American counterpart’s event last July – but it still decided to unveil a series of smaller-yet-still-exciting details regarding its biggest and most-visited theme park resort, Walt Disney World. Let’s dive into all the Star Wars, Marvel, and Mickey Mouse updates, shall we? Let’s get to the biggest and juiciest morsels first – all those that have to do with the Star Wars Hotel, the biggest and juiciest project Disney has currently going on in Orlando, of course. Although Disney only officially unveiled the first-of-its-kind on-site (and in-park) hotel last summer, rumors and speculation long preceded the reveal, giving us an idea regarding the new luxury resort’s placement, specifically, and what kind of experience it would provide guests, generally. Tonight, we have official confirmation on it all. 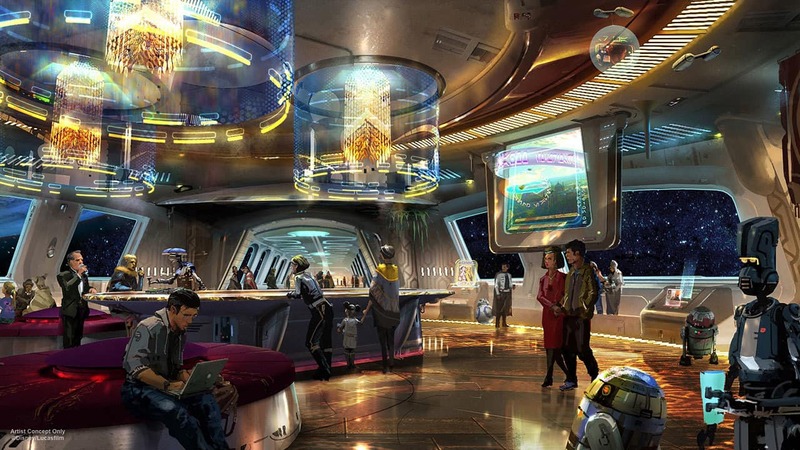 Expect the Star Wars Hotel to connect directly to Star Wars: Galaxy’s Edge, the new theme-park land that is due to open sometime next year (probably late summer). 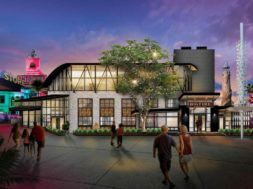 Yes, that’s right – the venue will technically reside on Hollywood Studios property proper, as we fully expected, making it a first for Disney World. 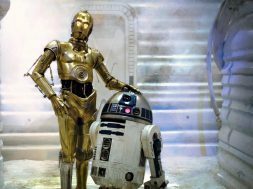 Even better, the company is promising that visitors’ real-life role-playing will commence as soon as they enter the building: “Guests immediately become active citizens of the galaxy and can dress up in the proper attire.” (Don’t worry – just as with Galaxy’s Edge itself, if you don’t wish to play a particular character, you won’t have to.) 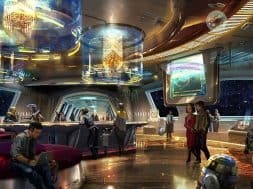 And just to serve as the cherry on top, Disney has also announced that every one of the hotel’s rooms will feature a window view directly into space, sealing the illusion that you’re on a starcruiser departing Earth and making its way to Batuu, the ancient trading-port planet that Galaxy’s Edge is located on. 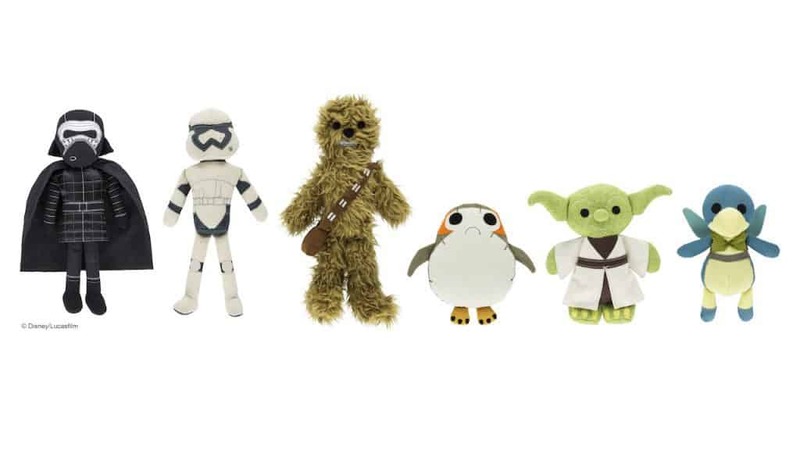 As exciting as the Star Wars-themed hotel is, there’s another part of Galaxy’s Edge that has gotten our little nerd hearts a-patter: the exclusive merchandise. Before the advent of Universal Orlando Resort’s Wizarding World of Harry Potter – Diagon Alley, such a preoccupation would’ve seemed aberrant; now, however, having seen what the theme-park maestros have come up with to further immerse us in our favorite sagas – especially after getting our hands on what Walt Disney Imagineering managed to cook up for Pandora: The World of Avatar – getting that same kind of detailed love for Star Wars is easily one of the most-anticipated parts of the new land for us. Yes, Disney may have likewise officially revealed at the Stateside D23 Expo last July that a roller coaster dedicated to Guardians of the Galaxy, that still-new and extremely-popular movie franchise, was being built at Epcot, but other than stating that it would replace the long-running Ellen’s Energy Adventure, no specifics were offered in the slightest. That changes now – at least, a little bit. Expect the new Marvel ride – the first to be built at Disney’s Florida resort – to be one of the longest enclosed coasters in the world. 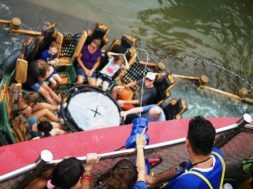 It’ll also sport a brand-new, “innovative” ride system and will be built for the entire family to enjoy – not a bad combination at all, and one we can’t wait to find out even more about. Given the company’s wording of having Guardians open in time for Walt Disney World’s 50th anniversary celebration in 2021, we don’t expect this to bow any time before January of that year. And since Guardians of the Galaxy, Vol. 3 is largely expected to hit theaters in May of that year, we might actually have narrowed down the release window even further. The last kernel Disney offered its fans overseas may also be the shortest, but it’s nonetheless exciting. 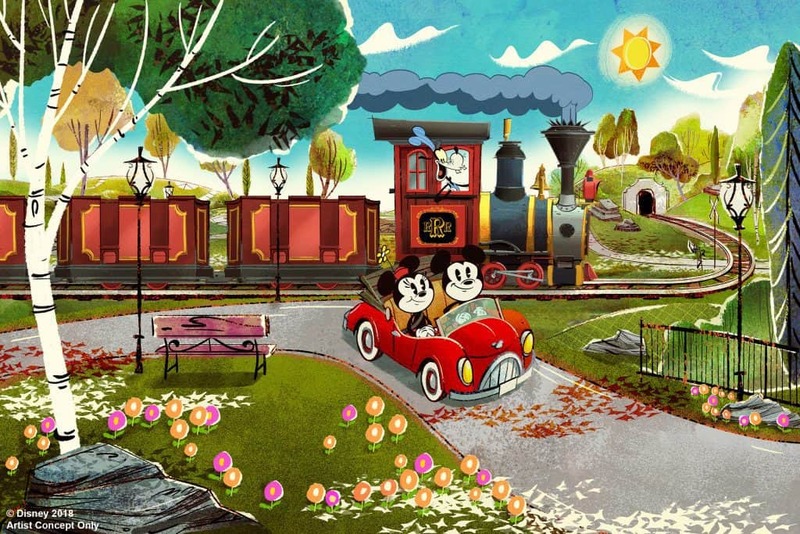 We now know that Mickey and Minnie’s Runaway Railway, that “2½D” attraction that will serve as the new flagship ride at Hollywood Studios (yes, even with Toy Story Land arriving this year and Star Wars: Galaxy’s Edge materializing next), will open in 2019 (just as we predicted!). And, thanks to the new piece of concept art that the company debuted, we also have received our very first glimpse of its ride vehicles – again, nothing too Earth-shattering, but also something to whet our appetites for the main course that now isn’t that far away. 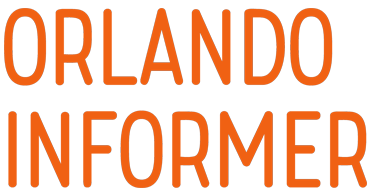 Be sure to follow Orlando Informer on Facebook, Twitter, and Instagram for more on Walt Disney World, Universal Orlando, and other Orlando attractions. Is this the REAL name of Star Wars Land? 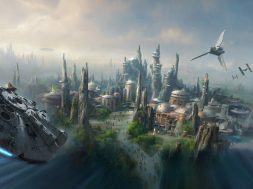 Did Disney just confirm a major Star Wars Land rumor? Marc N. Kleinhenz Marc N. Kleinhenz’s first dream in life was to be an astronaut. His second was an Imagineer. 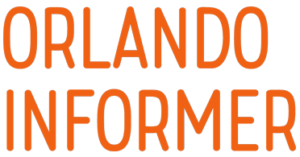 While neither completely worked out, he now works exclusively for Orlando Informer as a writer, editor, and podcast co-host. He’s also written for 32 other sites (including Screen Rant, IGN, The Escapist, and California Informer [OI's sister site]), has had his fiction featured in several publications, and has even taught English in Japan. Imagineering school won’t be too far behind.